So we all know that Coraline is the newest trend, well actually it's a two year old movie that I like. But what I do know is it is the best thing since sliced bread, maybe even the best thing BEFORE sliced bread, depending on what that was. Anyways.... Here are some of the things I like best about Coraline, or just something random that I found or I'm just thinking about. Other father's song from Coraline! it when Coraline meets him for the first time. I love this song! So I just found out there is a Coraline book!!!! WHOA!!!!!!! That is DEFINITELY going on my wishlist! There is only one problem; the cover. 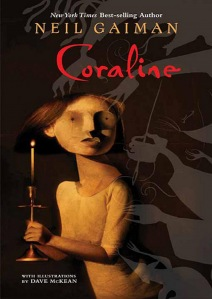 Coraline on the cover has BROWN hair not BLUE!! :( Sad. *Coraline is played by Dakota Fanning. *Wybie's name full name is Wyborn Lovat. *the ghosts that the other mother trapped call her the Beldam which in an archaic word that means witch or hag. * Wybie and Coraline are 11 years old. * Mel Jones or Coraline's real mother has a neck brace, probably from the car accident Coraline mentions early in the movie. *Originally, Coraline was going to be a live action movie but they realized that was stupid and decided against it. Okay so I watched the movie then read the book, now there's a GRAPHIC NOVEL!!!!! And guess what I got for my birthday....... The graphic novel!!!!! I read the graphic novel like for times and may I just say that it was like 10 times better than the book. unfortunately the other mother looked almost NOTHING like I pictured, or saw in the movie. First of all everybody had BROWN hair instead of blue. A little disappointing, but I can deal with that. Oh well. It was still good. Coraline has just moved to her new apartment, the "Pink Palace" in Ashlin, Oregon. She is eager to explore the vast outdoors, but she is stuck inside her dismal and dreary house due to the constant down pour of rain. With parents who ignore her for the jobs as writers for various garden catalogs, dreadful meals that are hardly eatable and an outdoors that offers both promise and quite a lot of rain, Coraline is looking for some light in her life. So when a mysterious doll appears that just happens to be a mini version of herself, she is eager for some excitement. Along with the doll, Coraline finds a small door leading to a much enhanced edition of her own she is excited to explore. She soon meets what is called her "other mother" who has created a world specifically designed for Coraline. The other mother and the alternate world is completely similar in appearance to her own, except for one detail, all the people have buttons for eyes, much like her doll's. It's paradise until Coraline is ready to return to the real world. Once returning, Coraline finds her parents missing, she knows the other mother is to blame. Now, it is up to Coraline to defeat the other mother and save her parents. To find out more watch the trailer below!